With this release, the visual look of attributes on website cache pages will match those in the Geocaching® app. The names and meanings of attributes have not changed. For example, “Recommended for kids is still “Recommended for kids.” However, that attribute, which used to look like this now looks like this . Another example is “Needs Maintenance,” which changes from to . The “new”-look attributes have appeared in the Geocaching® app for several months. When our team began working to add attributes to the app, they found that the existing attribute images were not big enough, due to changing technology since the attributes were originally created. As a result, they had to recreate the imagery, and used it as an opportunity to clean up the images. 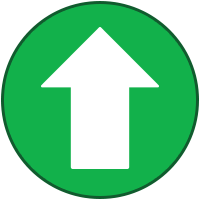 Most attributes are now the same color, objects such as people, animals and vehicles face the same direction, divers dive the way they should, that sort of stuff. Matt E (CompoundMatt) from HQ's Product Design Team is watching this thread to answer questions whenever possible. Popular reaction I’m seeing from Cachers online: Why is GCHQ worried about these small attribute changes when there are so many bigger issues in the game to fix? GCHQ has done a great job this past year in building a base to change the game for the better with moves like Virtuals coming into being and the new Friend League. What about things like improving the Wherigo app? What about fixing the challenge cache guidelines so they aren’t just “reward caches”? Love the work you’ve done in the past year; but we are seeing people ask why this is a focus right now so I thought I would pass it along here. Try a hard refresh. It should go away after that. I agree. Yet another trivial change for no real gain, when so many things are neglected. In the forum posts scuba attribute is a diver. And what does a game console controller and a walking stick have to do with scuba? I particularly like the "Recommended for kids" now showing that adult supervision they should always have. Thanks. 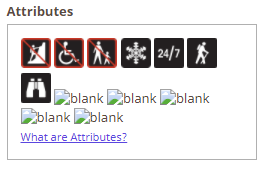 No big deal, but I thought you might have taken the opportunity to make the 'tool tips' on the cache page consistent with the descriptions on the attribute descriptions page (https://www.geocaching.com/about/icons.aspx). Uh, "Available at all times" implies all times of year too, but there's a separate attribute for that. And why a two-syllable word "during" when a shorter "in" works just as well? "Available in winter." I'm not being petty; your eyeballs can skim over the short version faster. Multiply by millions. And maybe I'm just being dense, but... That large-person-beside-[squint]-small-person-with-red-slash image, the red slash clearly means no, but it takes a bit of thinking to figure out, no what? Without peeking at the text of course. No grownups? No holding hands? And IMHO, this , when shrunk to website size like above, is less clear than the previous version. Takes a bit of visual parsing. To be fair, this just seems to be normal agile technology development (i.e., eating the elephant one bite at a time). I'm sure GS has a lot of initiatives going on simultaneously. Releasing these small changes doesn't necessarily mean there isn't work on "bigger issues" in progress. Just another minor thing I noticed. The takes less than 1 hour attribute used to have the clock face at one o'clock, so it's one hour, right? But the new one has it set to nine o'clock. That large-person-beside-[squint]-small-person-with-red-slash image, the red slash clearly means no, but it takes a bit of thinking to figure out, no what? Without peeking at the text of course. No grownups? No holding hands? As for the "Takes less than 1 hour" attribute, I see 9:00 on cache listings, but 1:00 on the article and edit pages. It would be nice to have things be consistent across the board, both in the content and the file type. Another note: the red crossing line in the "negative" attributes is poorly placed on some of them. For example, on the "Not stroller accessible" icon, the line cross right over top of the push handle on the stroller. Also, on "Not recommended for kids", the line covers the child's upper hand. Both of these make the icons less recognizable. They should be modified such that the crossing line doesn't cover any important parts of the icons. Around these parts, some of us refer to the shrunken websize image as "Don't forget your purse"
Incorrect. As far as I can tell, they are implementing Agile without the follow-up steps. Go back and count how many of the serious issues with previous releases have been addressed. Answer: almost none. Example: solution checker released last October (that's almost 5 MONTHS ago) has not had almost-trivial fix implemented. Fixing bugs and addressing customer feedback is supposed to be the core of Agile development. Since we have seen practically zero of either of the above, one is forced to conclude that Groundspeak is not, in fact, doing Agile development.